Step back into the Victorian era when orchids were a symbol of luxury, and walk leisurely through the Orchid Forest at the Franklin County Conservatory and Botanical Gardens in Columbus, Ohio. These beautiful orchids, entitled Orchids! Vibrant Victoriana, are displayed in the Dorothy M Davis Show House, which was built in 1895. The exotic orchid speaks of refinement and innocence and the elegant Victorian garden is filled with hundreds of incredible orchids in all sizes, shapes and scents. 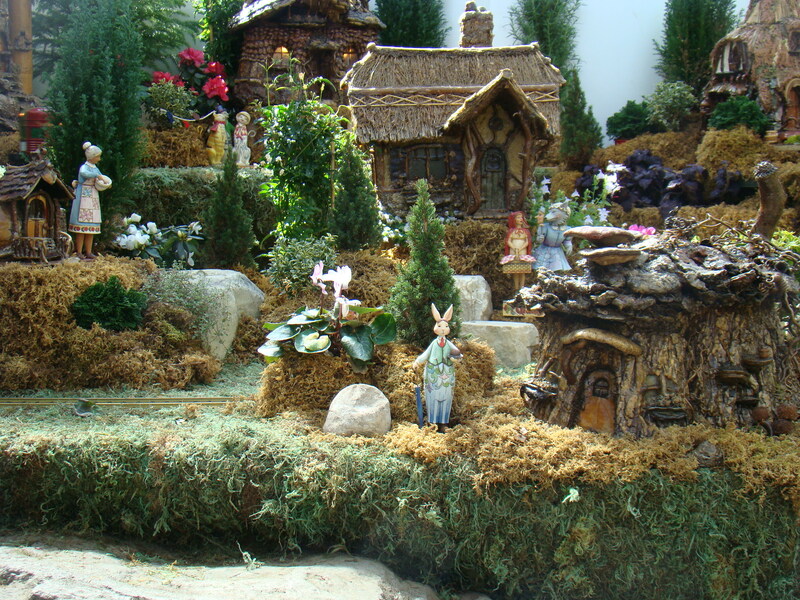 Paul Busse’s Garden Railroad featuring children’s fairy tales is a popular place to stop and take a break. In this magical world amongst the foliage in the Himalayan Mountain Biome, three dimensional structures are all made from natural materials. You might see roof shingles made from fungus, a chimney cap from an acorn, or a door hinge from a tiny leaf. Moss, twigs, leaves and seeds combine to form houses, bridges, and castles. Children will definitely enjoy the fairy tale settings, while adults will marvel at the construction of the scenery. 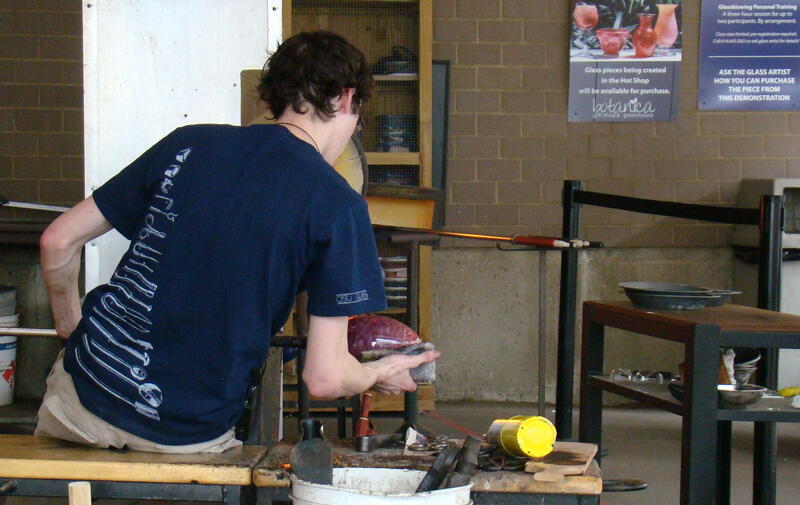 In an outdoor garden area, discovered the Hot Shop where a young man, who had been blowing glass for two and a half years, showed the curious visitors how to create a vase. From gathering the hot, hot glass to dipping it in either powdered colored glass or pellets, the glassmaking process produced many questions from those watching. Especially found fascinating the use of thick layers of wet newspaper being used to shape the glass, as seen in the picture above. The young man told the attentive audience, “We are still finding out new things about glass every day. It is an ongoing learning experience.” His finished vase, which started out with a red glow, turned out to be a beautiful violet shade. 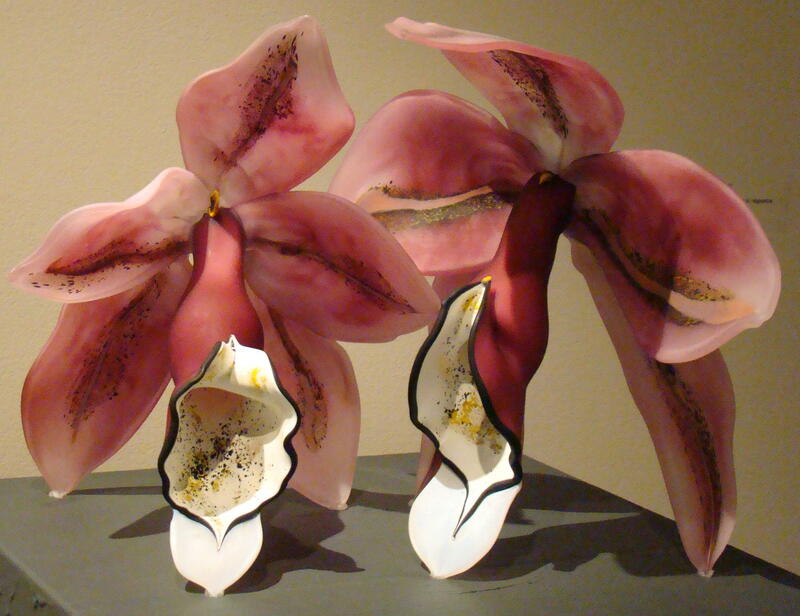 An added attraction was the beautiful blown glass art work by Debora Moore, Collectanea Botanica – Orchidaceae, showing her interpretations of orchids in blown glass sculptures. 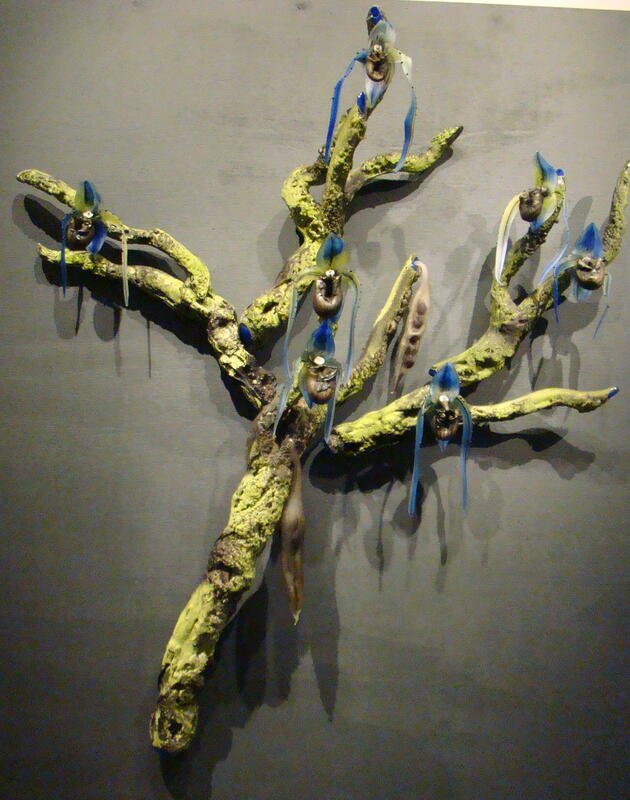 The Blue Orchid Tree, a beautiful Moore creation, is featured just inside the Cardinal Health Gallery. Debora feels that her work is a figment of her imagination combining the real qualities of the orchid with what she sees in her mind. This glass artist was a student and later an instructor at the Pitchuck Glass School, which was founded by Dale Chihuly whose work is also featured throughout the conservatory on a permanent basis. My favorite artistic display was the large Pink Glass Orchid. Nature has always been Debora’s inspiration as she uses the medium of glass to express the grandeur and fragility of the natural world. She constantly learns and combines new methods with traditional glassblowing techniques to create her masterpieces. 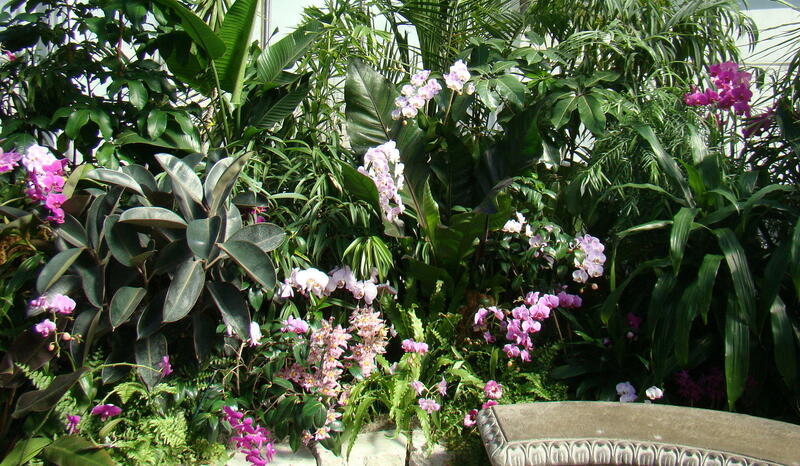 Today, orchids are the top house plant with 25,000 varieties available. Symbolizing rare and delicate beauty, the orchid is an alluring and captivating plant to enjoy in your home. Franklin Conservatory is one of those places you can visit again and again, as they have featured shows throughout the year as well as an outdoor garden that blooms seasonally. Walt Whitman wrote,”Give me a garden of flowers where I can walk undisturbed.” This is one of those special places that answers that request. Franklin Park Conservatory can easily be reached off I-70 as it passes through Columbus, Ohio. Exit on 315 North and quickly you will make another exit onto Route 40 where you will turn right. You are almost there as just a few blocks through the city, you will find Franklin Park on the right hand side.